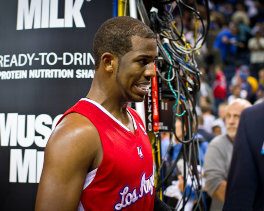 PG: Chris Paul ($19,455): Coming back from his recent shoulder injury, Paul has picked up right where he left off. He is on a three-game streak of double-doubles with four in his last six contests. Paul’s defense has also been great, as he has managed 15 steals in the six games since his return. He also gets duo of Patrick Beverley and Jeremy Lin whose strong suit is certainly not defense. Paul will be well worth his hefty price tag today. SG: Kent Bazemore ($6,355): Since his trade to Los Angeles, Bazemore has put up a new season-high in three straight games. Those games have seen him score 15, 17 and 23 respectively. He has played over 30 minutes a game since joining the Lakers, and in Mike D'Antoni’s system that means fantasy gold. For a small hit against your cap, Bazemore should provide a solid source of fantasy points. SF: Thaddeus Young ($17,345): Earlier in the year, Young went on a two-week tear that helped him fly up fantasy charts. He again appears to be on one of those such streaks, as he has a ridiculous 58 points, 18 rebounds, 13 assists and 13 steals in just his last two games. Because Philadelphia is so porous on defense, they are forced to run on offense, which means huge numbers for the Sixers best player. PF: Elton Brand ($9,984): With the Hawks front line decimated by injuries, the veteran Brand has been forced into big minutes. He is averaging 34 minutes a game in the last week, and has seen a nice bump in stats. Brand had a big double-double last week, but followed that up with a 1-point and 6-rebound dud against the Knicks. He is coming off of a solid fantasy game last night and should again be in line for big minutes against an equally banged-up Celtics front court. C: Robin Lopez ($13,340): Another player taking advantage of injuries in Robin Lopez. With LaMarcus Aldridge out, Lopez has posted a double-double in four of his past six contests. He is also coming off of a 7-block performance against Denver. With his brother Brook out for the Nets, Robin should again be a good bet for a double-double with a few blocks thrown in. U: The Orlando Magic: The Magic are tonight’s lucky team who gets to take on the Sixers. Having just given up 130 points to one of the worst offensive teams in the league, Philadelphia is a dream matchup. Anyone who is healthy and getting more than 20 minutes is a great play in any league.